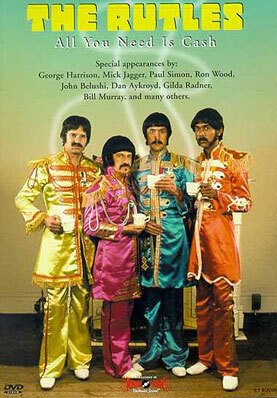 With the release of The Rutles in 1978, a whole new genre was born – the rock mockumentary. Irreverent, ridiculous and utterly hilarious, this film charts the rise and rise of ‘the pre-fab four’, a British pop group bearing remarkable similarities to The Beatles. Dirk McQuickly (Monty Python’s Eric Idle), Barry Wom (John Halsey), Ron Nasty (Neil Innes who wrote all the derivative music) and Stig O’Hara (Rikki Fataar – the man Bonnie Raitt calls ‘The Gazelle of Groove’) were discovered “far from home and far from talented” in Hamburg’s Der Rat Keller. But, as our hapless reporter (also played by Idle) informs us they ‘made the ’60s what they are today’ with hits like ‘Ouch!’, ‘Let it Rut’, and ‘Yellow Submarine Sandwich’. Featuring black and white archival footage of screaming fans and live performances from the band as well as interviews with people who observed the whole phenomenon like Mick Jagger and Paul Simon, The Rutles will have you rolling about in your home entertainment aisles. There are even cameos by John Belushi as heavyweight thug Ron Decline and, in a real coup, George Harrison as a reporter interrogating Michael Palin about the crumbling fortunes of Rutle Corp. A highpoint comes when it is revealed that Bob Dylan was the man responsible for introducing the lads to that mind altering substance, tea. Under its influence The Rutles held wild tea parties, fell under the spell of a Surrey mystic and released the landmark ‘Tragical History Tour’ album. Adding glamour to the film are appearances by Bianca Jagger as Dirk’s wife Martini and Penelope Tree as Stig’s favourite flower child. Nasty teams up with an artist called Chastity who looks just like her father, the guy credited for inventing World War 2, and together they embark on a Honeymoon rally in Nuremberg. Naturally, it’s the women who, as Mick Jagger explains, were responsible for the inevitable bust up of the band. It’s a riot of a film taking the piss out of Beatlemania so if you’re up for a good laugh, remember The Rutles motto: ‘All You Need Is Cash’.